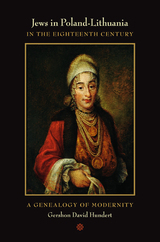 Missing from most accounts of the modern history of Jews in Europe is the experience of what was once the largest Jewish community in the world—an oversight that Gershon David Hundert corrects in this history of Eastern European Jews in the eighteenth century. The experience of eighteenth-century Jews in the Polish-Lithuanian Commonwealth did not fit the pattern of integration and universalization—in short, of westernization—that historians tend to place at the origins of Jewish modernity. Hundert puts this experience, that of the majority of the Jewish people, at the center of his history. He focuses on the relations of Jews with the state and their role in the economy, and on more "internal" developments such as the popularization of the Kabbalah and the rise of Hasidism. Thus he describes the elements of Jewish experience that became the basis for a "core Jewish identity"—an identity that accompanied the majority of Jews into modernity. Gershon David Hundert is Professor of Jewish Studies and History at McGill University. He is the author of The Jews in a Polish Private Town: The Case of Opatów in the Eighteenth Century (1992), the coauthor of The Jews in Poland and Russia: Bibliographical Essays (1984), and the editor of Jews in Early Modern Poland (1997) and Essential Papers on Hasidism: Origins to Present (1991). 5. Was There a Communal "Crisis" in the Eighteenth Century?